OTHER GUYS “WANNA BE “! Join the family of over 8,200 subscribers who Learn To Play Guitar BETTER with Gaylerd! The OFFICIAL Home of the “WOW!Factor™” Acoustic Guitar Guy! Hi, I’m Gaylerd. Welcome to GaylerdGUITAR™. The OFFICIAL website for learning how to put “WOW!Factor™” into your guitar playing. You know it doesn’t matter if you’re a seasoned guitar player, or never even held a guitar before. Here on GaylerdGUITAR™ I’ve got lessons for EVERY level guitar player. STREET-SMART Beginner Guitar Lessons – If you’re new to guitar, then my Street-Smart Beginner Guitar course will teach you how to play guitar from the ground up. I’ll teach you how to hold a guitar so it feels good in your hands and how to hold a pick, the way I do, so you get the most out of your fretboard and chords. After that, you’ll learn how to play 12 of the most popular chords that are used to play thousands and thousands of songs, and how to spice up those chords to bring those songs to life! BIG DAWG Guitar™ – Intermediate Guitar Lessons –If you’re an intermediate player, then my BIG DAWG Guitar series will teach you how to add smooth flowing, melodic, harmonies, cool sounding riffs, fills and transitions to your chords. Big Dawg Guitar really will teach you how to become the guitar player other guys talk about when they say thing like… “Man, I wanna play like him!” Click here to watch a few FREE lessons! So what are you waiting for? Get a membership to GaylerdGUITAR today and start becoming the guitar player OTHER GUYS wanna be. And I’ll see you in the videos. “STAY INFORMED! I send out occasional newsletters with guitar learning tips, tricks and thoughts. So if you’d like to stay in touch with me, subscribe now. What’s so different about GaylerdGUITAR? It’s the Experience! 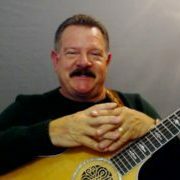 The Bottom line is this: You’ll learn to play songs on acoustic guitar better and enjoy the entire guitar learning experience more because GaylerdGUITAR is almost like having your own personal guitar coach on call 24/7. It’s his Teaching Style! Another big difference is the teaching style! Gaylerd does more than just show you how to play chords. He’ll teach you step-by-step how to put his signature “WOW!Factor”™ into the songs. Plus, Gaylerd’s warm friendly approach makes you feel as if you are learning the songs right there in the studio. It’s the Tutorials! One more HUGE ADVANTAGE for you is in the tutorial itself. Each video lesson includes some really cool and helpful learning features that many other teachers just don’t take time to edit in. Features like on screen Chord Diagrams, real-time riff tabs, and other helpful on-screen tips. Gaylerd’s tutorials will teach you how to do a whole lot more than just play a few riffs and strum a few chords on your acoustic guitar. They’ll teach how to put “WOW!Factor“™ into the songs! LEAVE A COMMENT TO EVERYONE!